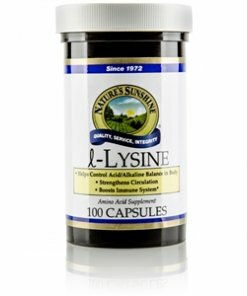 Nature’s Sunshine l-Lysine supports the body’s circulatory and immune systems. An essential amino acid, l-Lysine may help strengthen blood circulation, balance the body’s acid and alkaline levels, and help the immune system create antibodies. l-Lysine may also help with the absorption of calcium. 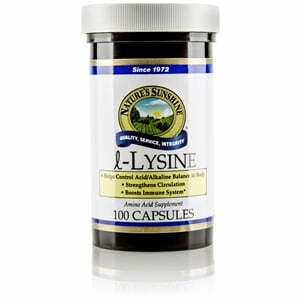 Nature’s Sunshine l-Lysine comes in 500 mg capsules. Cellulose (plant fiber), silicon dioxide (powdered silica), magnesium stearate (vegetable), kosher gelatin and water.